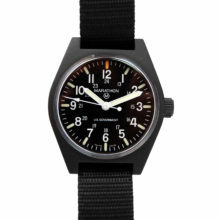 U.S. Military Navigator’s Watch by Marathon Sterile version in 3 colors! 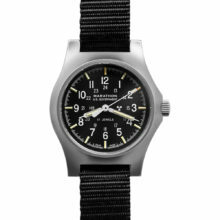 This is a current issue (USAF and USN) Tritium Tracer Navigational Wristwatch designed for pilots and parachute missions, with a sterile dial (no government markings). 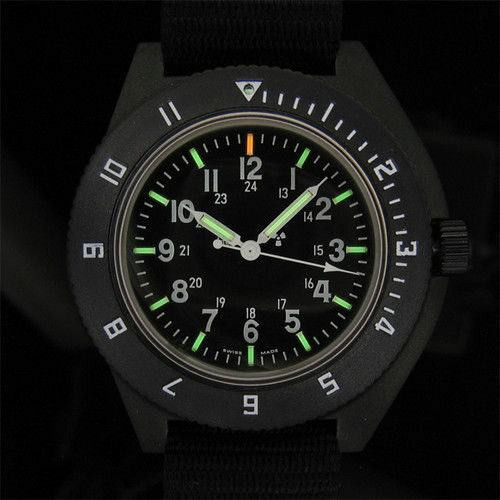 The self illuminated 24/7 tritium gas tubes glow 20 times brighter than an ordinary luminous watch for up to 25 years, without the need to pre-glow the watch in a light source. 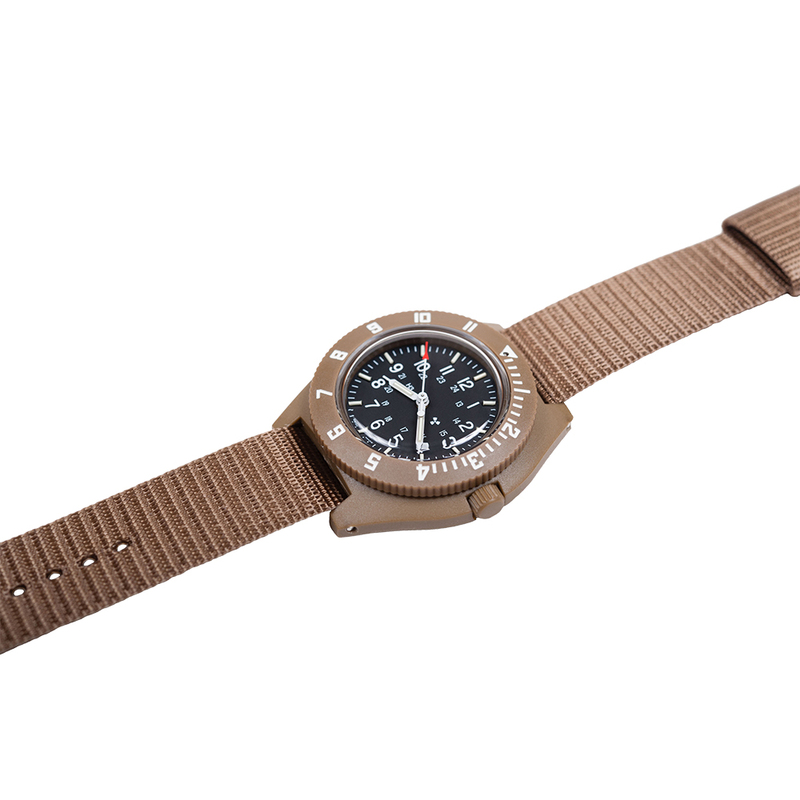 This lightweight unit features a Swiss made high precision Quartz Movement and is water resistant to 6 ATM (196 Ft). The case is made of an extremely durable nylon/fiberglass composite material. The rotating outer bezel provides marking for a second time zone. The stainless steel back has full military markings. 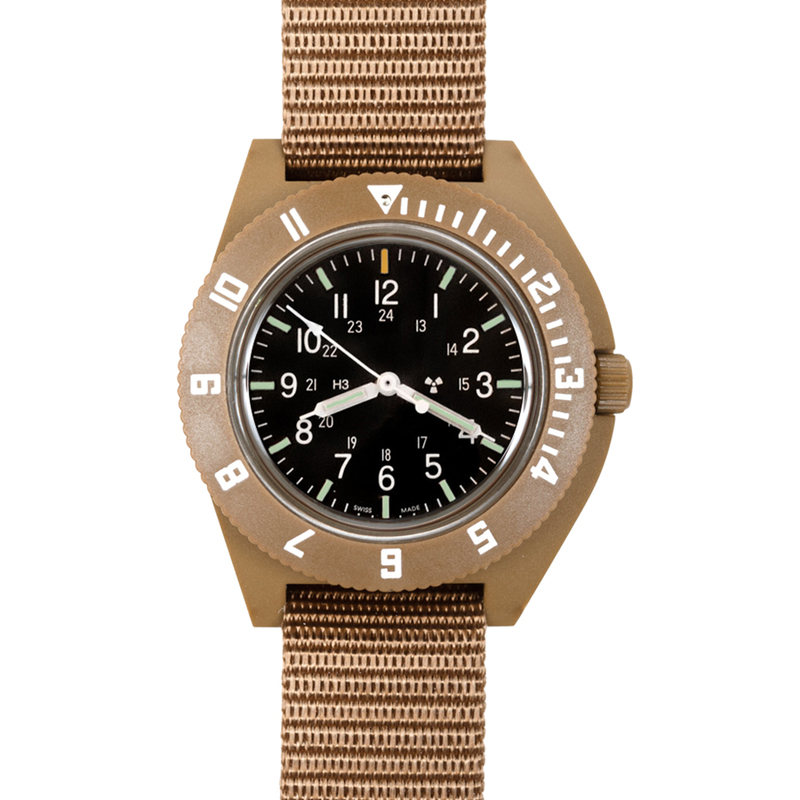 The Marathon Military Navigator Pilots Quartz is a highly accurate watch built to strict military specifications. It is lightweight and very comfortable to wear. 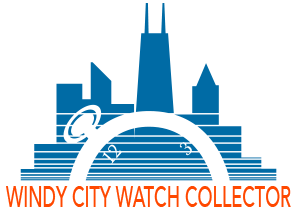 Highly recommended — Makes a great everyday timekeeper. 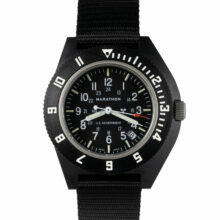 Navigator’s Watch by Marathon — Sterile with no government markings – now comes in 3 colors! 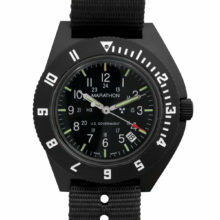 This is the current issue, USAF and USN, Tritium Tracer (Glass Tubes) Marathon Navigator watch that glows 20 times brighter than an ordinary luminous watch. The unit also features a high-quality Swiss made high precision Quartz Movement. 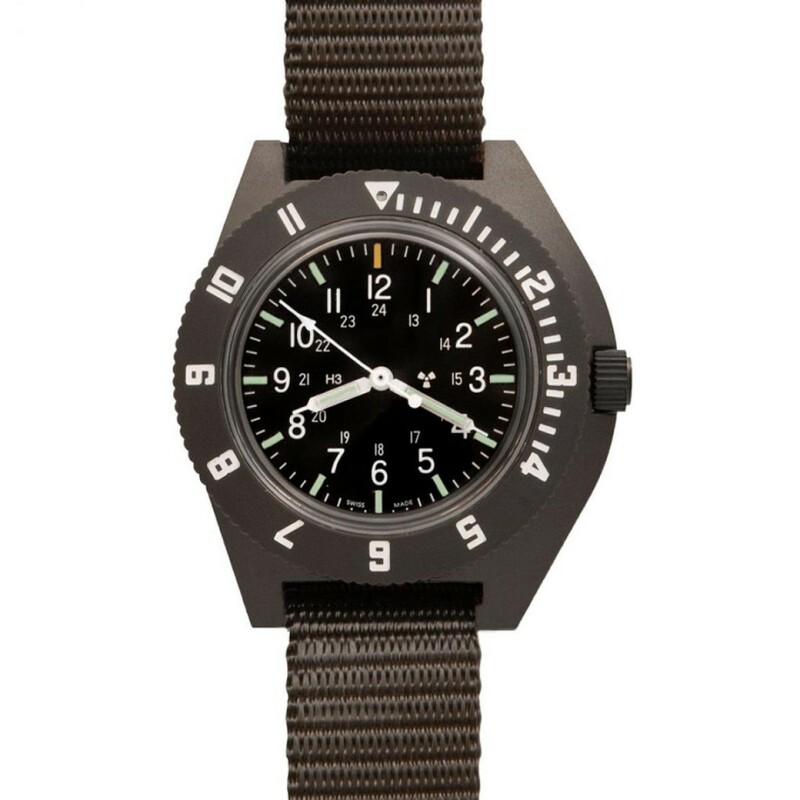 The watch is water resistant to 6 ATM (196 Ft). 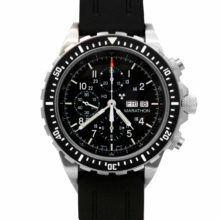 It is designed for maintaining accuracy at high altitude to 35,000 ft without compensating pressurization. The case is made of an extremely durable nylon/fiberglass composite material. 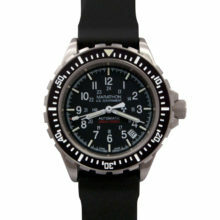 The rotating outer bezel provides marking for a second-time zone. 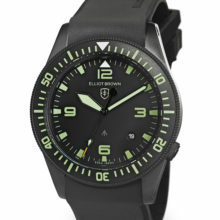 The dial is without government marking and features the radioactive symbol (Tritium isotope). 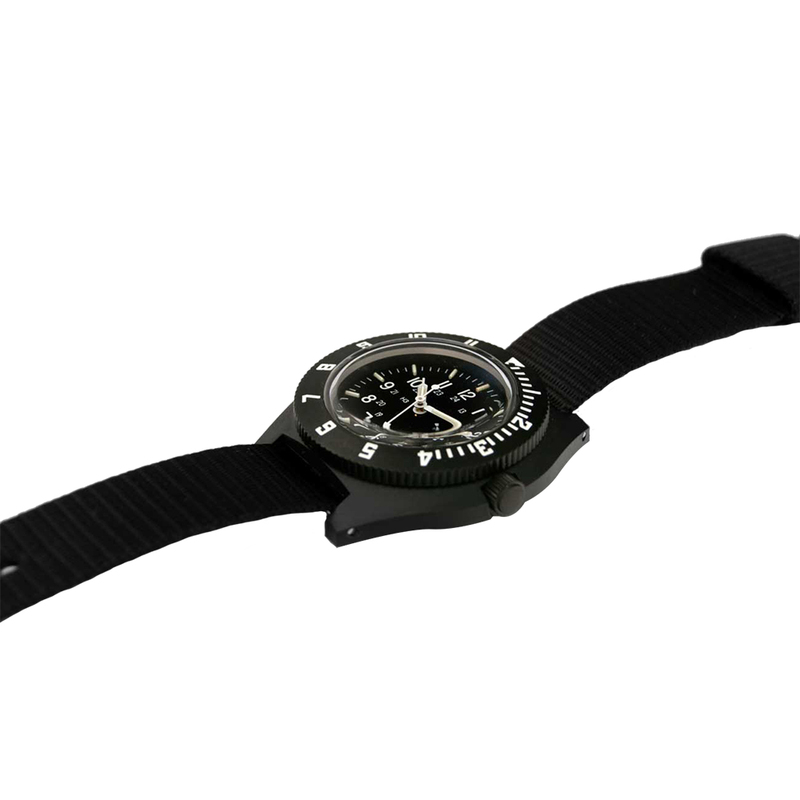 The stainless steel back has full military markings including “Watch, Wrist: Navigators”. 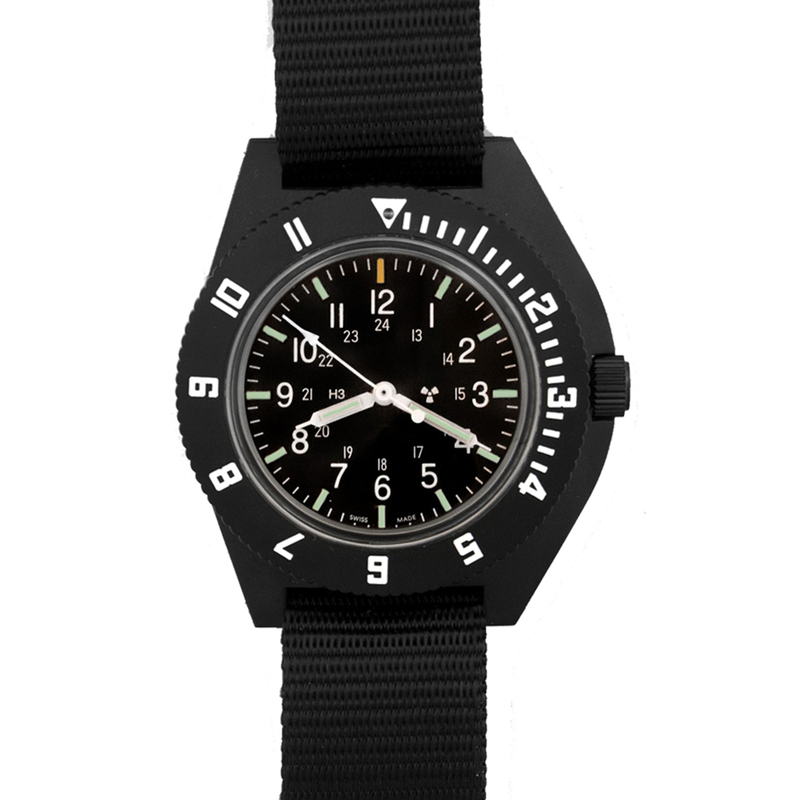 This is brand new and comes complete with black nylon flight strap (watch can be worn on the wrist or over one”s flight jacket) and original box and instructions. 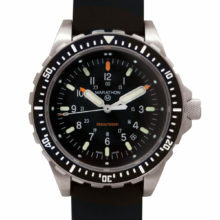 The Marathon Military Navigator Pilots was first developed in 1986. 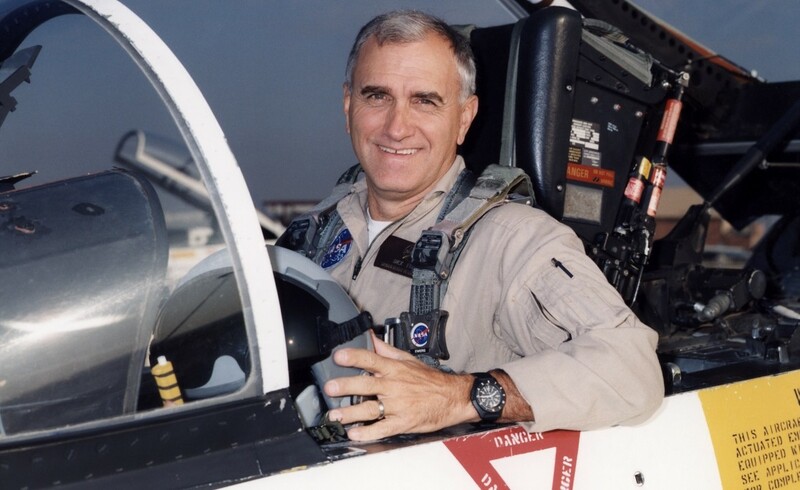 It was made as a request by Kelley Air Force Base for a watch which could be used in situations a pilot or parachutist would encounter. 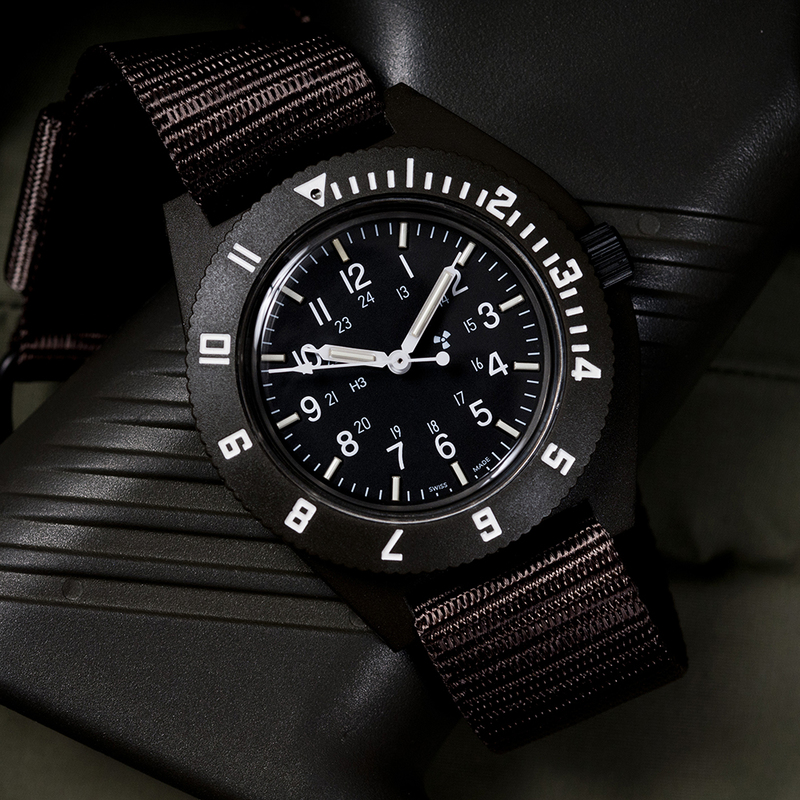 Marathon fulfilled this request with the Navigator Pilots Quartz. 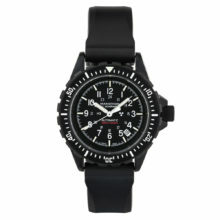 Made from a special fibershell case that is water resistant to 6 ATM, sweat and shock resistant, as well as lightweight. 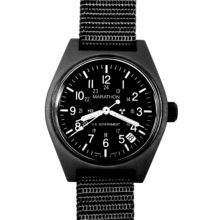 Included with the Military Navigator Pilots Quartz is a 20-millimeter width nylon strap made under MIL-S-46383B, Type III. 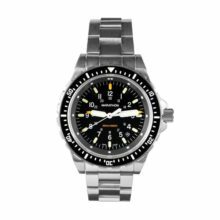 The watch uses an acrylic crystal resistant to rapid changes in pressure that would otherwise cause a watch’s crystal to shatter. 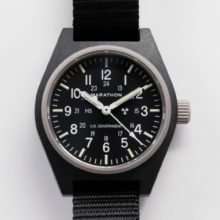 The Navigator Pilot’s Quartz is made in La Chaux de Fonds, Switzerland. Powered by a Swiss made, high torque, 3 jewel ETA F06 Quartz movement, the Navigator Pilots Quartz guarantees you a high degree of accuracy in timekeeping. The ETA F06 is accurate to -0.3/+0.5 seconds per day and includes an End of Life (EOL) indicator. 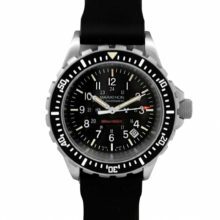 The Navigator Pilots Quartz uses self-contained Tritium gas tubes to ensure constant visibility in low light situations. 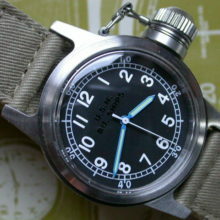 A tube is located on each hour marker, each hand, and at the 12-hour marker in the bezel. Tritium tubes are self-illuminating gas tubes which contain an isotope of hydrogen that glows consistently for years without the need to pre-glow in the light. 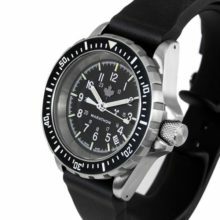 The Navigator Pilots Quartz combines military durability with Swiss craftsmanship in a timepiece that will satisfy you for years. 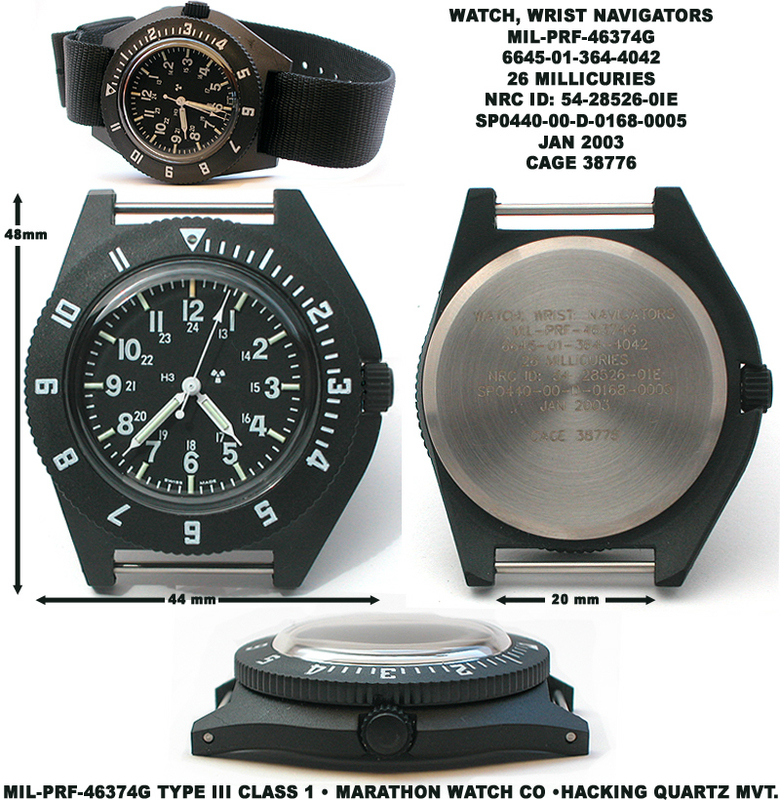 MIL-SPEC: The Marathon Navigator watch is manufactured in accordance with MIL-PRF-46374G Type III, Class 1 US Government Specification. Issued and worn by troops in Iraq and Afghanistan. TRITIUM GAS TUBES: Self-illuminated 24/7 tritium gas tubes for up to 25 years. 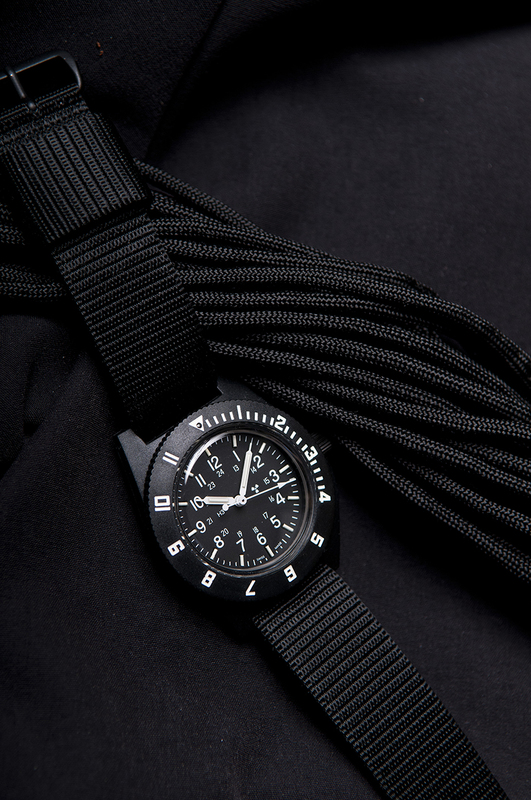 SWISS MADE: Proudly handmade in La Chaux de Fonds, Switzerland since 1939. 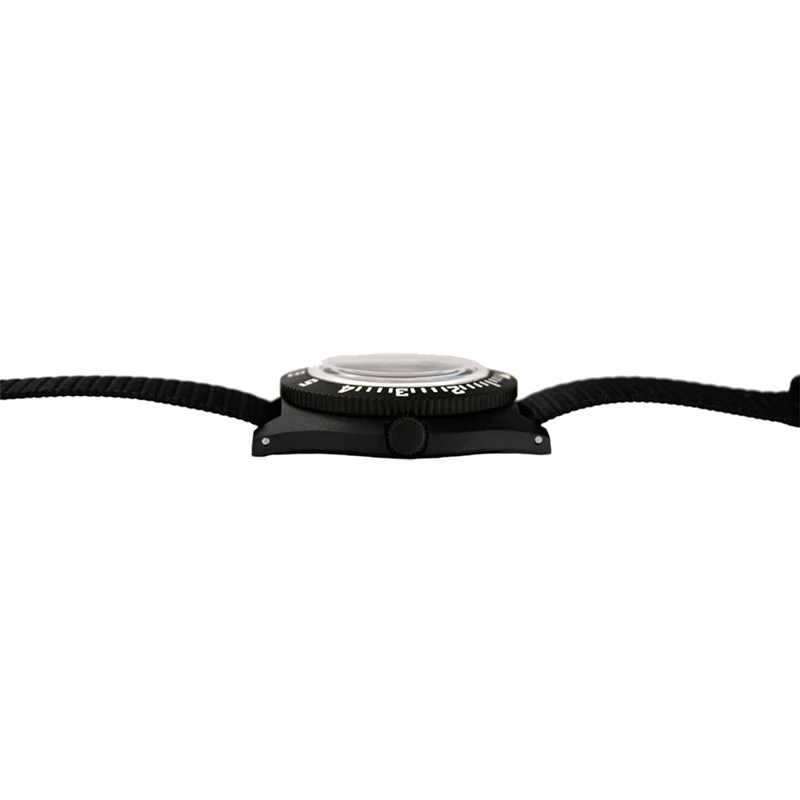 Uses ETA F06 high-torque 3 jewels Quartz movement with EOL (End-of-Life) indicator. 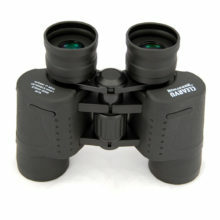 NSN NUMBER: Nato Stock Number 6645-01-544-9475 engraved on case back.